I do find these colour challenges so inspiring. 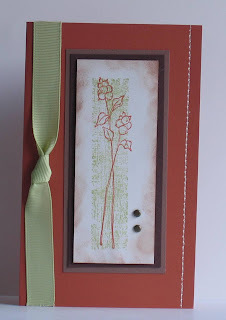 I have use Oh so lovely stamp set from Stampin Up! 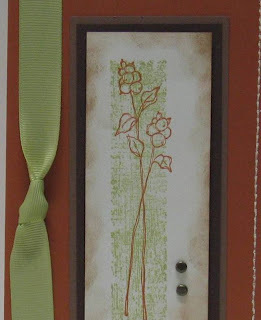 I have stamped the linen background in Certainly Celery on Whisper White card and then stamped the stem flower in Real Rust, using my sponge dauber I have used Close to Coco to sponge around the stamped image. This is then layered on Close to Coco and Chocolate Chip and adhered to the Real Rust card. I then used the paper piercing kit and joined the dots with my white gel pen for the faux stitching. The card is embellished with Certainly Celery ribbon and brads. Oh how elegant! I love it!